They say true style doesn't age, and newfound 95-year-old model Erni Stollberg is living testament to the notion. I first came across this Jacquemus-, Haider Ackermann– and Dries Van Noten–clad lady a few weeks ago, thanks to Instagram's "discover" section, and I've been hooked on her ensembles ever since. She's wearing these rad clothes thanks to a Vienna-based designer boutique and concept shop called Park. How and why did they find her? Well, according to Vogue.com, it was an entirely serendipitous and unexpected relationship that developed over time. Ernestine, who lives nearby, would often say hello to the store's co-founders, Markus Strasser and Helmut Ruthner, and the fashion legend goes that after the pair bought a puppy, Erni was drawn back to the store time and time again. She turned out to be a natural in front of the camera, and her aptitude for pulling off some of the most challenging runway looks is converting into sales for the brand—particularly with a young audience. "If I put something very elegant on her, she immediately has an elegant pose," Strasser, Park’s co-owner and stylist, told Vogue. "If I put something trashy or something cool on her, her attitude changes immediately for that kind of look, and I almost don't have to say anything." Keep reading to check out Erni's latest looks for Park's Instagram account and see what we mean. Style Notes: Autumnal colours are now coming into stores—so why not wear them all in one look, like Erni's Sacai coat, Acne Studios boots and matching berry opticals? Style Notes: In clashing prints from Ann Demeulemeester, Dries Van Noten and Acne Studios, Erni proves that big shapes and big motifs are best worn tonally. Style Notes: Just. So. Cool. There is very little else we have to say about this velvet-and–Mongolian sheepskin combination. 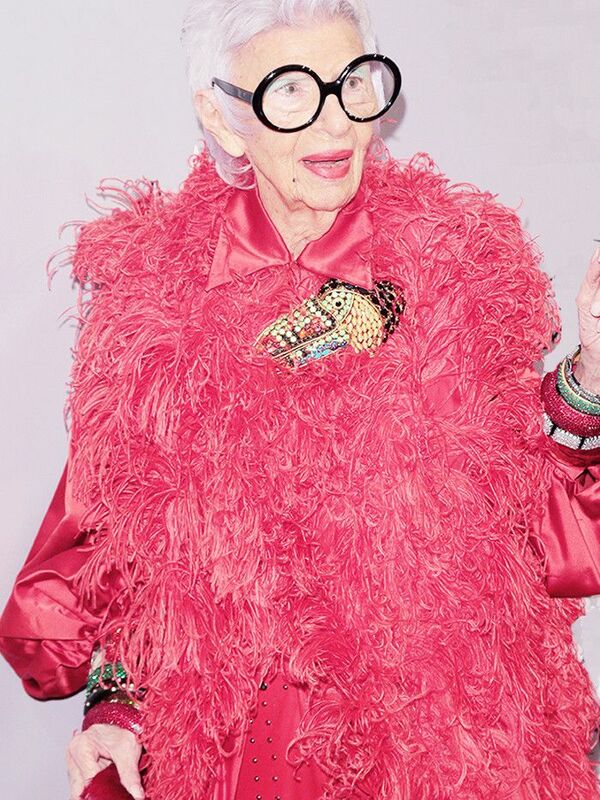 Style Notes: See, didn't we tell you no trend was too tricky to master for this nonagenarian? Here she's completely at home with basically wearing a giant pillow hand. Style Notes: From the exaggerated cuffs to the knotted silk blouse and socks worn with court shoes, I want to steal everything about this look. Style Notes: Well, wouldn't you be happy wearing a gorgeous lace dress from Sacai too? Style Notes: Mixing streetwear and utilitarianism with dashes of whimsical femininity, this ultra-layered formula does it all. PS: I want those Jacquemus pointed shoes, please. Style Notes: Sometimes, when your outfit is so mad, you just have to sit down and take a moment to chill. Style Notes: Even Erni's into the new label everyone's talking about, Petar Petrov. This gorgeous camel coat is from her fellow Austrian. Next up, your simple guide to autumn/winter 2017's fashion trends.